The clouds roared and rain poured in Mumbai on the evening of 2nd June 2011. The weather is still (extremely) sultry, but after a long summer, the cloud cover is beginning to take over the sun. As the pre-monsoon showers bathe the ground and wash the dusty leaves, many little flower buds will bloom into a grandeur celebration. While the rain will provide a respite for shriveled roots and thirsty throats, the flowers will provide a nutritious feast for the nectar lovers. 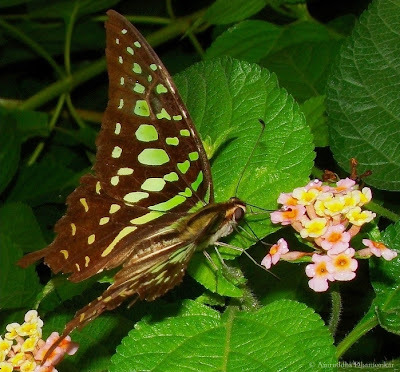 It is that time of the year for one of the favorites of all the butterflies, bugs, beetles, ants, bees and wasps – Leea. ﻿Although I’m not sure about the quantity of nectar, or any other nutrients present in these tiny flowers, they sure must taste delicious! And for this reason, Leea is renowned in the insect world. As Monsoon is just around the corner, let’s take an exclusive look at Leea, and a few other monsoon flora including the rival Lantana camara. 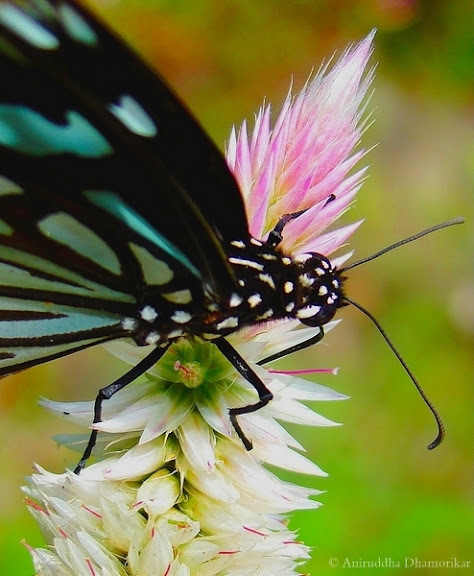 ﻿All of these insects are known to feed exclusively on nectar. There are some you wouldn’t expect to see who also have a knack for this sugary treat. Bugs in the Order Hemiptera, such as the Shield Bug (Superfamily Pentatomoidea) pierce the flowers (and not the stem). Assassin Bugs (Family Reduviidae) have been noticed lurking beneath the inflorescence. 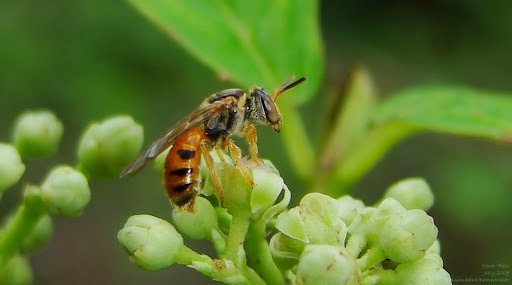 A variety of Beetles and Weevils, such as Click Beetle, Fireflies, Net-winged Beetles and Leaf Beetles have been seen on the flowers – probably feeding on nectar as well as other flower parts. Flies (Order Diptera) also love to lap up the juices, with Bottle flies (Calliphoridae) and various Muscid flies visiting the flowers, but, surprisingly, not in large numbers. 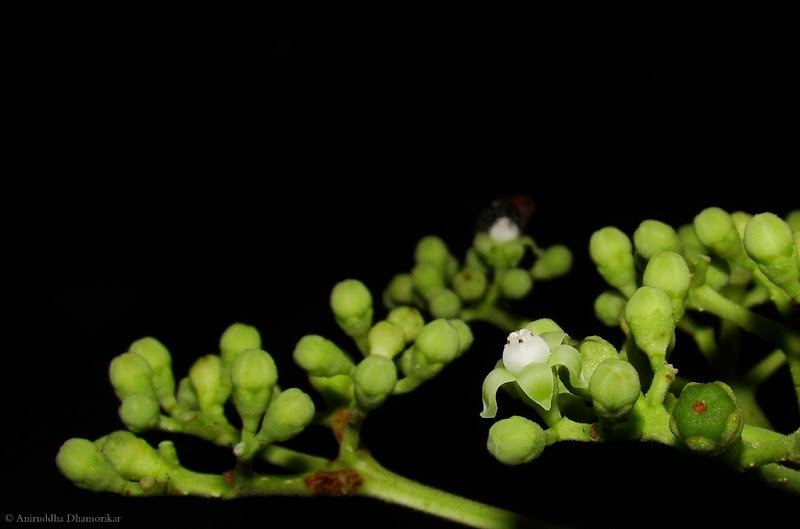 It is truly marvelous to observe so many insects feeding co-operatively on a single plant, making Leea Bar a safe place to drink and enjoy – but nothing is as decent as it looks. There are dangers lurking in the downtown surrounding Leea – beneath, or even on top of the flowers. Predators such as Assassin Bugs and Praying Mantises stalk the streets day and night. There are also arthropods of the fourth kind (I mean with four pair of legs) – Arachnids, the commonest observed on the flowers are Lynx Spiders (Family Oxyopidae), besides the wandering Jumping Spiders (Family Salticidae) and stealthy Crab Spiders (Family Thomisidae) and sometimes an odd Orb-weaver (Family Araneidae). 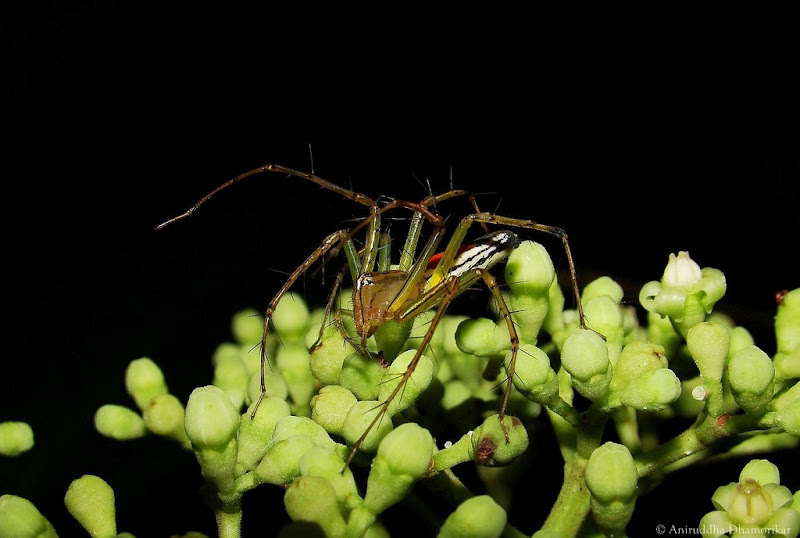 I have also observed Harvestmen (Order Opiliones) on the inflorescence – but I’m not sure if they were feeding on the plant or predating on the visitors. ﻿﻿It’s quite something to count all the Families as well as species that visit Leea. 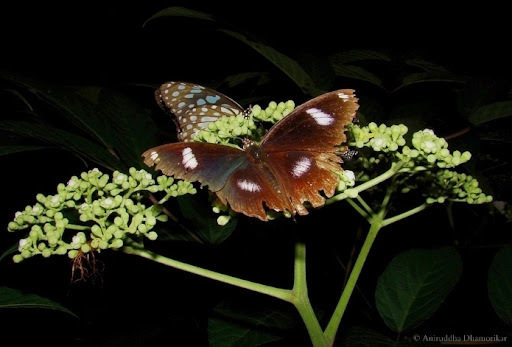 In a study conducted by my friend on insects that feed on Leea indica, she found about 20 species of butterflies (adults) feeding on its flowers. In all the amazing flora diversity in Mumbai, the only plant that may openly challenge Leea is Lantana camara – an exotic species introduced as an ornamental plant from the American tropics. ﻿Other flora to look for, especially for insects this Monsoon are – Balsam (Impatiens sp.) 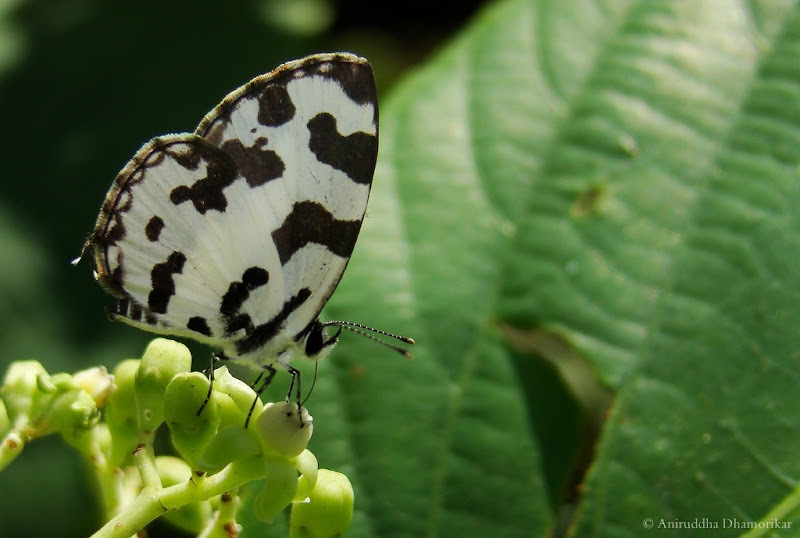 which are good to observe bees, flies and Crab Spiders; Pea (Vigna sp.) are commonly visited by butterflies; Tridax is an excellent herb to observe butterflies; as well as Cockscomb (Celosia argentea) and Commelina sp. among others. It will be interesting to make notes of the feeding activities of different animals on Leea and other monsoon flora. If you’re willing to keep notes, do share your observations which will help us understand more about these plants’ role in the ecosystem within the city limits and beyond. 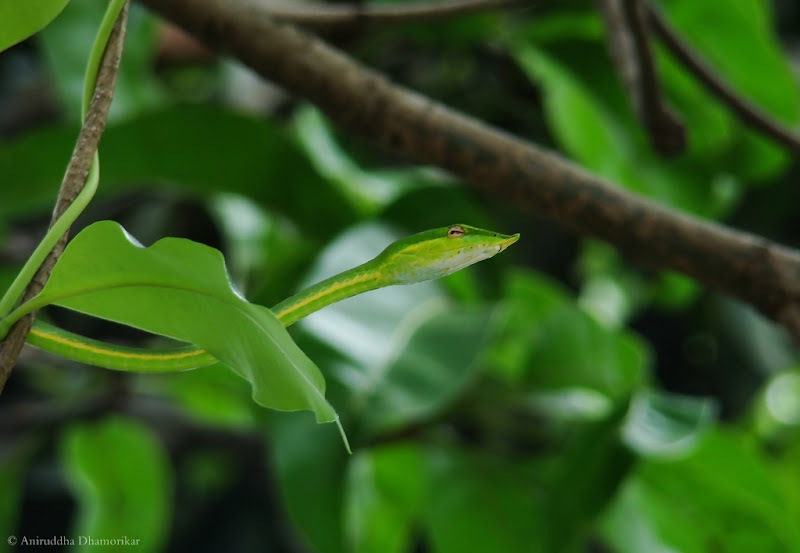 Vine Snake on a Mango tree! A delightful read and as usual great photos. The vine snake, is it poisonous! It has a kind face. From this angle at least! You captured such a variety of animals on your plants. They are so colorful. And the snake is a brilliant green... very pretty. This was a good learning experience for me. Thank you.